Narendra Packaging Private Limited has been serving the Pharmaceutical industry since 1982, first as a partnership firm and later on as a private Limited company, with zeal and enthusiasm. The Company works with a vision to deliver products of the highest quality and on time as required by the customer. The Company’s policy is woven around customer satisfaction, which is evident by the long STANDING ASSOCIATION with all the customers. Due to wide range of its customers, the Company’s products reach almost every part of the country and several parts of the world. The state of art manufacturing facility that the Company has established helps it in producing up-to half a million Caps and half a million Seals everyday to meet the Customers needs in time every time. One of the most important aspects of a manufacturing facility is the people. The Company is lead by Mr. Narendra Shah, who has been in the Industry for more than 25 years and has vast experience in the manufacturing process. The company employs well-qualified and educated staff, they are skilled and technically sound, who have acquired more than 15 years experience in this industry. Together they strive to satisfy the customers in the areas most critical to his needs; be it on time deliveries or consistent quality. The road ahead looks challenging. The company needs to constantly innovate and improve customer satisfaction to the highest level. Only a quality product, delivered on time would satisfy a customer. 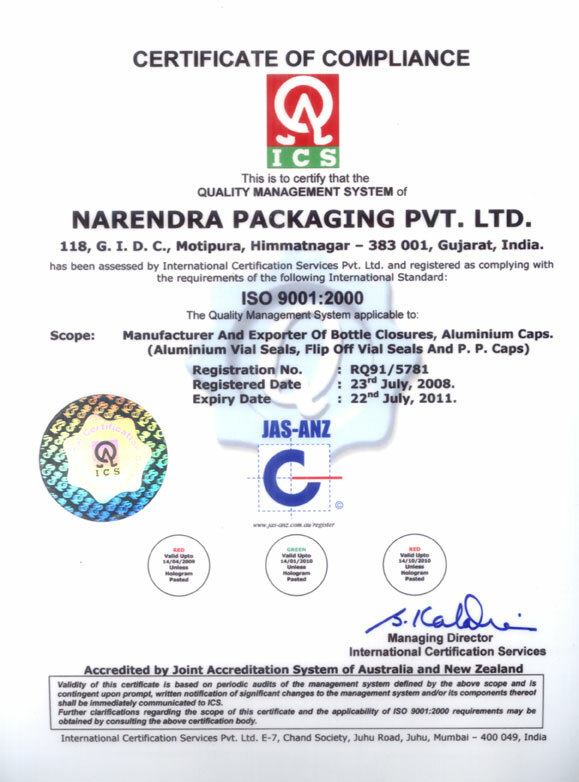 We at Narendra Packaging Private Limited are constantly putting forward our best efforts to achieve Customer Satisfaction. Continuous Up gradation of technologies has been a tradition at NPPL. We have all the infrastructure for excellence in-house. Our powerful tool room capabilities are reflective of this search for excellence to deliver the best products to our customers.